Johnson, Mildred “Mugger” “Banty Rooster”, age 103, of Seven Mile, met her Savior Friday, April 6, 2018 at her residence. 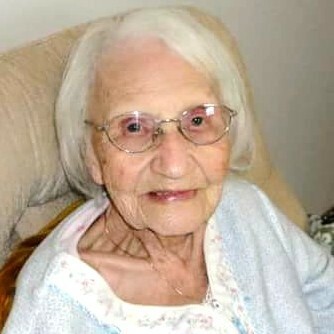 She was born June 6, 1914 in Eaton, OH to Elsworth and Gertrude (Redd) Coning. She was a mail transporter for the post office to and from the railroad tracks, a clerk at the Weaver’s General Store, Bob’s Pizza, and Tom Lotz Store in Seven Mile, an AVID Reds Fan, and a Full-Time mother and homemaker who loved spending time with her family. Mildred left to carry on her legacy her children, Pamela G. Grooms and Judith K. Dunham; daughter-in-law, Ruby Johnson; grandchildren, Bernie (Edna) Johnson, Sheila Grooms, Lisa (Tim) Moore, Marty Grooms, Tommy Dunham, Todd Brewer, Shonda Dunham-Griffin, Ryan Dunham, Mindy (Mike Owens) Dunham ; great-grandchildren, Justin (Megan) Meek, Robbie Johnson, Tiffany (Robert) Hamblin, Dusty Bowman, Lindsay Taylor, Kayla (Brad) Sorrell, Xach Dunham, Mike Owens II, Kenzie Gabbard, Brandon Griffin II, Savannah Griffin; great-great-grandchildren, Hailee Hamblin, Mason Sorrell, Carsyn Manning, Emalyn Sorrell, Xach Dunham II, Wyatt Meek, T.J. Hamblin, Levi Miller, Brayden Botts, Matthew Meek, and numerous nieces and nephews. She was greeted at the stairway to Heaven to be taken home by her parents; husband, Fred Johnson; son, Bernard Johnson; sons-in-law, Tom Dunham and Jim Grooms; grandchildren, Tammy Johnson, Michael Grooms, Kimberly Grooms, brother, Stanley Coning and sister, Loretta Johnson. The family would like to give special thanks to Vitas Hospice and Vicki Barber for the special care they provided for her. Visitation will be held Tuesday, April 9, 2018 from 11:00am-12:00pm at Baker-Stevens-Parramore Funeral Home, 6850 Roosevelt Avenue, Middletown, OH 45005. A Celebration of Life Service will follow at 12:00pm at the funeral home with grandson Tom Dunham officiating and honoring his grandmother. Interment will be at Rose Hill Cemetery. Condolences may be sent to the family at bakerstevensparramore.com.